Visit the capitol city of one of the most unique country's in the world. Rent a Budget Rental Car on your vacation to Abu Dhabi. Budget and Rentacarmomma.com have partnered up to get you the best rates available for your trip. Click on the links below to get you started today. In 1793 the United Arab government was moved from the Liwa Oasis to Abu Dhabi Island when Sheikh Shakhboot Bin Zayed Al Nahyan built the castle over 200 years ago. The Palace is a an important historical feature in Abu Dhabi. 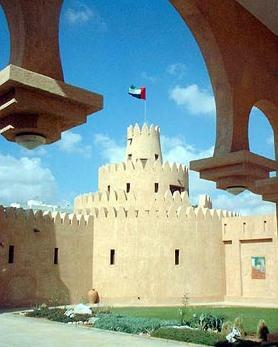 In past years the castle was home to the Abu Dhabi ruler, government offices, and justice courts. The Palace is made up of two sections, the first building as the original and the second one built in 1936. The castle has been carefully maintained through out the years by Sheikh Zayed and has been renovated to its original look. 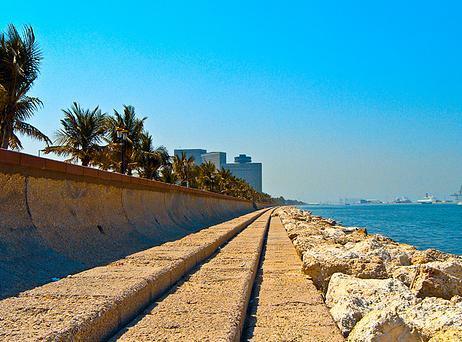 The Corniche is a road that extends almost 4 miles from the Sheraton Towers to the Hilton. The road is the place to walk or dive along to get the best views of Abu Dhabi. It is known all over the Middle East for the beauty that is seen with the gorgeous sea in the background. Gardens surround some of the walk that mark the boundary of the city and fountains are are placed in the intersections as well. Eco-tourism is an ever developing form of travel entertainment. For a great time exploring the wonders of what the world has to offer including the nature within Abu Dhabi, Noukhada Adventure Company is where it’s at. With plenty of ground to cover, Noukhada offers a well rounded experience in the beauty of Abu Dhabi. A guest of this fine country and company can partake in anything from kayaking, sailing and trail biking. There is instruction for all of these great adventures, and they are definitely adventures to say the least. There is also an impressive list of adventures that each guest can go on. These adventures are done either by bike, or by boat and kayak. Some of the tours offered at Noukhada include a kayak fishing tour, the Mangrove Tour, a tour of Bird Island, ATB or all terrain biking, and plenty of other tours and experiences as well. There is so much to see and do in Abu Dhabi, but aside from shopping and dining, becoming one with our planet is the best way to begin to understand and respect it. Do something different, go on an adventure! Hertz and rentalcarmomma.com have got what you need just for your your trip to Abu Dhabi. We have provided some great Hertz Discount Coupons just for our rentalcarmomma customers. With thousands of Hertz locations all over the world, Hertz is sure be to your rental car choice. Discover Abu Dhabi with an exciting tour of the desert. 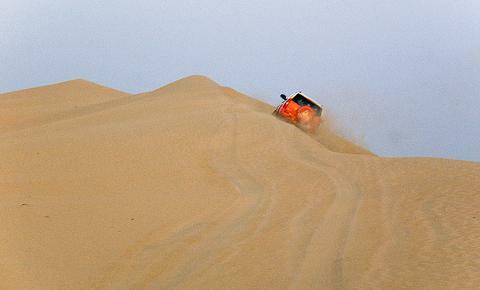 Drive through the dunes at night or through the city and experience the scenery of the Capital City, Abu Dhabi. Take a tour of the city while stopping to take some great pictures. Travel to one of the worlds largest shopping mall. The tour takes you through the many historic areas. Its an all day adventure with a knowledgeable guide that will show around the beautiful city of Abu Dhabi. Belonging to the Umm an-Nar culture, the Hili Grand Tomb is the most important Tomb out of the collection of tombs located at Hili Archaeological Park. The tombs go back nearly to the second millennium B.C. The tomb has two entrances that are decorated with people and animal pictures. The tomb is 12 meters in diameter. Visits are only allowed from 4:30 to 9:30 pm. Avis Rental Cars strives for customer service and with that your Rental Car needs are sure to be met. Pick out the location, the car you want, and what time you want to pick it up and your set. Save with rentalcarmoma.com and AVIS with our AVIS discounts. Click on the link below to get started today. Dont be left struggling trying to find a taxi or bus on your vacation, get out there and explore on your own with Dollar Rental Car. With Dollar and RentalCarMomma.com we'll be sure you'll get the satisfaction you deserve. Check out our links below to get started. Kids Park is an animal park that allows the kids to interact with the farm and some of the wild animals. The park sits on 5 acres of farmland that has a pond and a large playground for the children to play on. The Park has tons of different animals from Camels, Sheep, Tortoises and Kangaroos to Meerkats, Hamsters, Iguanas and even 12 Aquariums of fresh water fish. The museum is made up of two main sections, Archaeology and Ethnography as well as a gift shop that makes up the third section. Besides what the museum hold inside, the building itself is a sight to see. In the Archaeology section there are many artifacts that are featured back to the early stone age thousands of years ago till today. The Ethnography section has a beautiful collection of female jewelry from pendants, hairpins, and necklaces all from the stone age that has been handed down from generations after generations. No Matter where your headed, Thrifty has some great rates for you. With over 300 locations in the US and over 3,000 in the world Thrifty is sure to have what you need. Save time and money with Thrifty.